What it’s about: While subjected to the horrors of World War II Germany, young Liesel finds solace by stealing books and sharing them with others. In the basement of her home, a Jewish refugee is being sheltered by her adoptive parents. Review: Despite all the hype around this film, I haven’t really been that bothered to watch it until now and I tell you what, I was kicking myself afterwards because it was one of the most enjoyable, eye-opening and life-affirming films I have seen in a very long time. 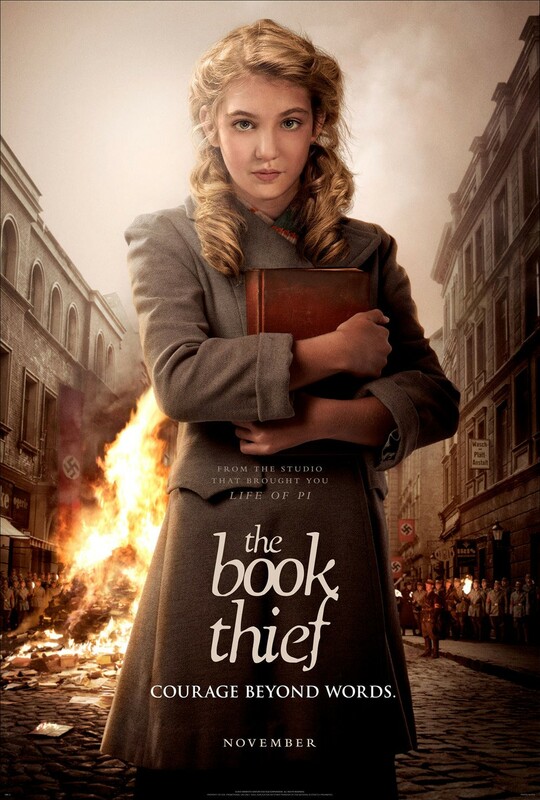 Set in Nazi Germany, The Book Thief follows young Liesel, who is being taken to live with an adoptive family, who finds solace in stealing books and sharing their stories, despite the fact that she can’t read at the beginning. Narrated by Death, the story follows the lives of Leisel, her adoptive parents, her best friend Rudy and Max, the Jewish refugee they are keeping hidden away in their basement. I just loved every aspect of this story and film. I find Nazi Germany absolutely fascinating and to see how it affected a young girl who wasn’t really sure what was going on was a different way to approach the subject. It wasn’t sugar coated for the audience’s sake either which I very much appreciated because often we overlook how gruesome that period in time actually was. I loved all the characters in this film – there wasn’t a single one I didn’t warm too – even Rosa, Liesels adoptive mother who she describes as being a thunderstorm. The relationship that formed between Liesel and Hans, her adoptive dad was absolutely beautiful and so touching to watch. Even the first time she is introduced to them and is reluctant to get out of the car, he’s the one that coaxes her inside by referring to her as ‘Your Majesty’ and throughout the entire film, he continues to treat her like a Queen. Hans is played by none-other than Geoffrey Rush who transforms remarkably into this soft and gentle role. Max, the Jewish refugee they are hiding in their basement was such a prominent figure for Liesel – their friendship blossomed throughout the film and they learnt so much from each other. The conditions he had to suffer just for being a Jew were disgusting and although the family were doing their best for him, it was difficult to comprehend that things like that actually did happen. The ending was completely unpredictable but predictable at the same time. Death tells us what’s going to happen before it actually does which although gives us a little time to prepare, doesn’t soften the blow of the catastrophe – which I think is the same for us and our lives as well. The whole idea of ‘The Book Thief’ I thought was absolutely beautiful, because being a book-lover myself, I can see why Liesel finds solace and joy in these books even when the world around her is falling apart. The books saved her and you don’t have to have been in Nazi Germany to understand that. The Book Thief is a poignant story which is dramatic and very real. It will shock you one minute and pull on your heart strings the next – it really does cover every sensations. It’ll make you realise that even though things aren’t perfect, you have to make the most of what is given to you and “when life robs you, sometimes you have to rob it back”. Nice review! I’ve read the book and watch the movie. The movie was great. The only thing that irritated me was that they left out really important informtion. But never the less it is a awesome movie! I’ve not read the book yet but when I do, I’ll make sure I watch the film as well! Sounds fantastic. I reaaaally need to read the book too, I’ve got it at home. Maybe we could read it at the same time and do a joint review or something? 🙂 The film was amazing, the trailer sends shivers down my spine! Yes, we should totally read it and put our thoughts together! Excellent review – I too had put off watching but will do so now – sounds like it might be useful to have a box of tissues handy!